Like so many other parents, I also took my daughter and her friend to see Disney/ Pixar’s latest movie, Inside Out. No, this is not a review because if it were…..it would be really short. The kids loved the movie, no doubt about it. As did I. But what I loved most was afterwards and weeks later, we are still talking about how it made us think and feel. 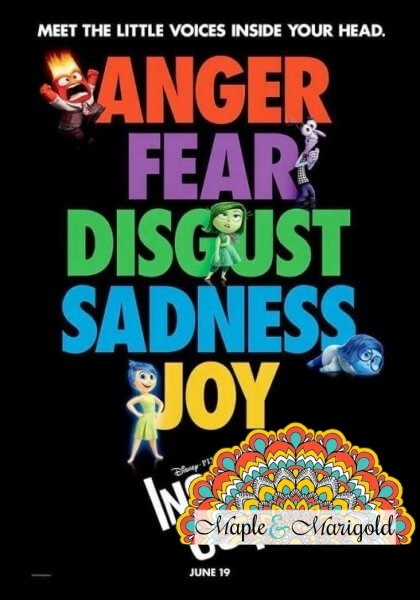 I confess, I don’t know much of what goes on inside a 9 year old’s mind (even though I have one and used to be one) but because of Inside Out now I know at least FIVE things. Joy, Fear, Disgust, Anger and Sadness, all are mashed up in there. But I am getting ahead of myself. Riley, the 11 year-old usually has the emotion Joy at the forefront of her brain. That switches with one of the other feelings depending on her circumstances and events around her. I feel I understand this a little better in real-life, it’s not moodiness just a fact of life living with a tween. The isolation that the girl feels when her family moves across the country is tough upheaval for anyone to face let alone a child. She leaves all her friends behind and then struggles to blend in with the new school. A great topic of conversation especially if your young one is facing a new school, or even a new classroom with unfamiliar faces. All this change starts to fade away aspects of Riley’s personality. The confidence she felt playing hockey, the contentment when she was around her parents, and the connection with her friends as they move on after she leaves for San Francisco. Don’t we all feel as if some changes are just too much to handle? Now imagine the social pressures that come along with middle school! Riley’s imaginary friend, Bing Bong comes to the rescue and tries to right things. 4 weeks later my 9 year-old still remembers the details of the scene where Bing Bong sacrifices himself to save Riley’s childhood memories. It made us all cry! Perfect starting point for the talk about going it all alone. It’s OK to ask for help when you need it whether it’s from your parents or even an imaginary friend. In the movie, the parents don’t realise that their daughter is simply shelving her sadness away without really addressing the issues. It’s only when she loses all her joy (the feeling and the main character in the movie) does she start to feel angry, scared and disgusted all the time, but mostly angry. 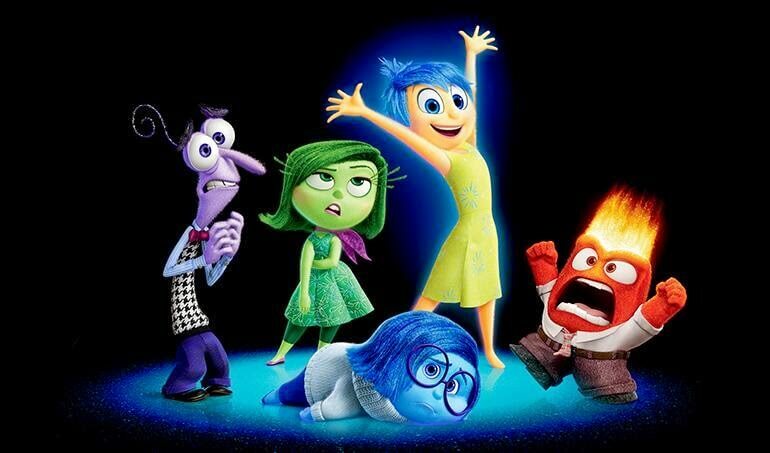 I love that as a result of watching Inside Out, the kids and I have had these talks about emotions, and how it’s OK to have so many of them whirling up inside of you. Simultaneously. So watch the movie. It has something for every age. The younger ones will enjoy the colours and the antics while the older ones will appreciate the meaning behind the antics. With school starting back up soon, it is time to get kids prepared for another year of learning and friendships, and yes, of cliques and bullying. In our case the movie opened the door to a conversation about feelings and how they convert into actions. That’s worth the price of a movie ticket, I say! So much more.